Playzy is a potentially unwanted application that our security experts classify as adware. 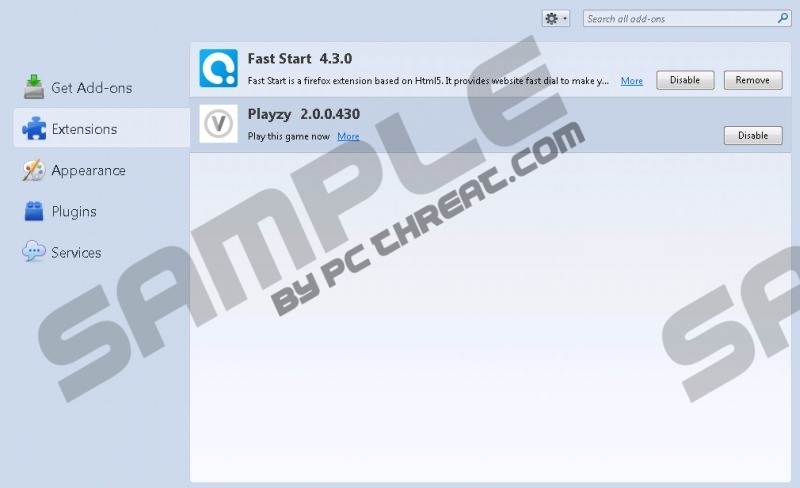 It has been created by the same developers who have previously released Wajam adware. Playzy looks like a decent application intended for online gaming, but you can be sure it does not live up to its promises. Rather than providing you with immediate access to online games, Playzy displays a lot of commercial ads that impede your web browsing experience. It is necessary to remove Playzy from your computer if you wish you continue browsing the web undisturbed. Scroll down to the bottom of this description for manual removal instructions. It is only logical to expect an online gaming application to have its own official homepage where users could download it from. Nevertheless, we didn’t come across any website that would distribute Playzy directly. Thus, if you have this application on your computer, it means that you have downloaded it bundled with freeware from third-party file sharing websites. Our research shows that Playzy often arrives with potentially unwanted software, and it is known to be traveling with the likes of PC Optimizer Pro. At the same time, if you are going to remove Playzy from your computer, check the list of installed programs in Control Panel for other unnecessary applications. When Playzy gets installed on your computer, it adds extensions to Mozilla Firefox and Internet Explorer web browsers. The extension does not seem to work on Google Chrome, but even so you have to remember that the application’s process ExtensionUpdaterService.exe is still running on your system. Hence, even if your browser does not support this extension, it can still get installed on your computer. None of the games Playzy offers are good. During our tests, we have found that most of the Playzy online games are underdeveloped and almost impossible to play. It means that the main reason this application enters your PC is money. Playzy tries to generate financial profit by displaying game-related advertisements. Even if you are an avid gamer, you will soon find Playzy ads extremely annoying. Not to mention that quite often these ads can be exploited by third parties to promote their own content. Playzy is not responsible for ad security, so clicking the ad might eventually lead you to a number of dangerous websites. You have to protect your computer from harm by removing Playzy right now. Sometimes manual removal may not be enough to terminate all the unwanted files and applications. If you think that there are suspicious programs on your computer, run a full system scan with the SpyHunter free scanner, and then install a licensed antispyware tool that would terminate all the potential threats automatically. Select Uninstall a program and remove Playzy. Open Uninstall a program and remove Playzy. Select Add or remove programs and uninstall Playzy. Disable and remove Playzy from Extensions. Remove Playzy from the list. Quick & tested solution for Playzy removal.